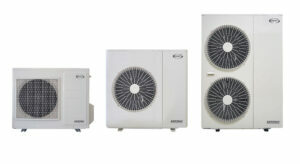 The Aerona 3 Air Source Heat Pump Range. We are Pleased and Proud to announce that we are Approved with the Micro-generation Certification Scheme to Design, Supply, Install and Commission Ground and Air Source Heat Pumps. for the latest in Air Source Heat Pump Technology please visit one of the following links, We are Approved Installers Grant UK and Mitsubishi and believe they all offer Unrivalled Support and Technical Knowledge. Many have heard of ground source heat pumps and the high efficiency levels they can offer but few have realised that Air Source Heat Pumps can also offer significantly higher levels of efficiency when compared to traditional methods of heating our homes. Air source heat pumps are much easier to install than ground source so they are more suitable for a wide variety of properties from flats to detached houses. For every 1kW of electricity fed into Ecodan, you will get at least 3kW of heating energy. The outdoor unit is a bit like your fridge in that it has a circuit of factory-sealed copper piping containing ozone-friendly refrigerant, which is continually compressed and expanded to extract the free, renewable energy from the air. Your fridge extracts heat from the box inside (to keep food cold) and rejects it at the back. 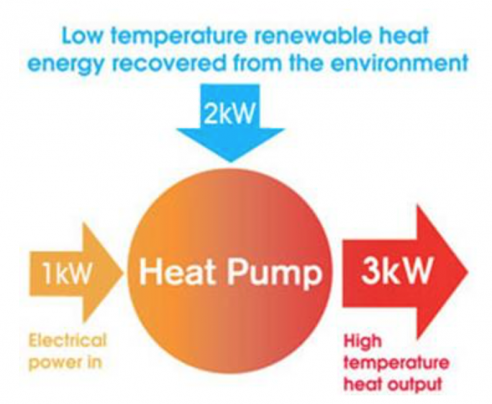 The air source heat pump works a bit like this but in reverse in that it extracts heat from the outdoor air and upgrades it to heat up your hot water supply. It can work efficiently all year round even if the outdoor temperature should drop to -15ºC. The Grant UK and Mitsubishi Ecodan range of air source heat pump systems have been developed specifically for the UK and bring advanced, inverter-driven technology refined in the commercial heating sector to your home.